Tim Howard is a U.S. soccer legend. He began his professional career in 1997, and at 38 years old, is playing goalkeeper for the Colorado Rapids MLS team. Howard is the most capped goalkeeper of all-time for the United States men’s national team, with over 100 caps since his debut in 2002. He has played professionally in the United States, in the European Premier League, and for the United States national team in the World Cup. So, as a professional athlete in a high-demand sport dominated by youth, how does he recover quickly and keep up his playing level? He takes advantage of cryotherapy benefits. Howard has applied the old adage “the best offense is a good defense” into his sports recovery plan. One of the tools he uses to prevent injury is whole body cryotherapy. 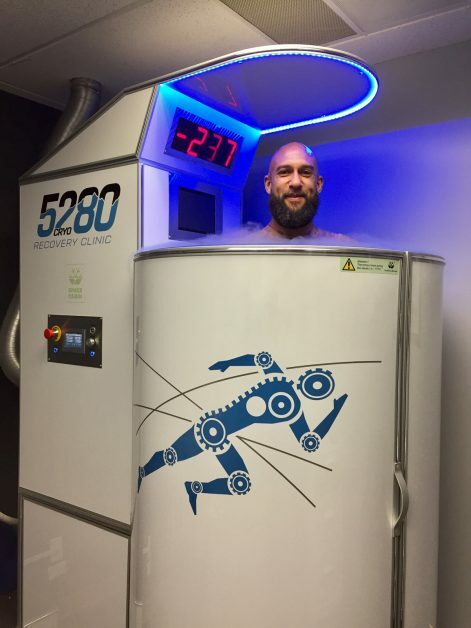 At 5280 Cryo and Recovery Clinic, we work with Howard to reduce inflammation and speed up recovery time between workouts. Each of our locations offers a variety soft tissue and sports injury treatment options to help athletes at all levels recover. Whole Body Cryotherapy (WBC) is a cold air session for athlete recovery. The Cryosauna uses nitrogen gas to lower the skin surface temperature by approximately 30-50 degrees Fahrenheit. In a typical session, athletes stand inside a cryotherapy chamber for 2-3 minutes, and cold air is blown over the body to stimulate the sympathetic nervous system. The skin’s reaction to the cold air sends a message to the brain that stimulates regulatory body functions, causing a flight or flight adrenaline response. The exposure to the extreme temperatures also triggers the release of anti-inflammatory molecules and endorphins, which helps reduce swelling and inflammation in the muscles, shortening recovery time. People often ask if cryotherapy is uncomfortable or if it hurts. The simple answer is no. Unlike traditional ice baths, cryotherapy sessions are not painful, and best of all, taking advantage of cryotherapy benefits only takes 2-3 minutes. A good comparison to a cryo session is like putting your hand into a 300-degree oven. You can keep it in there for a while before the skin absorbs the heat and your hand gets too hot, but if you touch the rack or pan inside, you will have an instant burn. Similarly, the body can tolerate cold temperatures for short amounts of time without pain or skin burns like frostbite. Rather, the cryotherapy benefits are instantaneous. Both chronic and acute conditions can be managed effectively using whole body cryotherapy. At 5280 Cryo and Recovery Clinic, we began implementing Whole Body Cryotherapy into our treatment protocols in 2012 and were one of the first clinics in the country to do so. Initially, cryotherapy benefits were only available in professional athletics training centers and not available to the general public. As more high-profile athletes and celebrities have begun using cryotherapy, it has become more accessible to athletes at every level. Want to learn more about cryotherapy benefits or schedule a session? Call or stop by any of our four 5280 Cyro and Recovery Clinic locations!